Oh, hello. We’ve done some digging in the latest SDK and it looks like Apple’s much rumored second-generation iPad will not feature some fancy 5 megapixel camera, but will instead shoot your flicks and take your pics with something close to a 1 megapixels. That’s awfully close to the fourth-generation iPod touch’s 0.7 megapixel back camera so we speculate they could be the same thing. That means you’ll be able to take some unwieldy 720P video with your iPad (whether you’ll be able to view that 720P video natively is another question). As for the front, it’s VGA, just like the iPhone 4 and fourth-generation iPod touch. The front-facer for FaceTime and taking pictures of yourself will do video recording too, if you had any doubts. As for how we are making the connection? 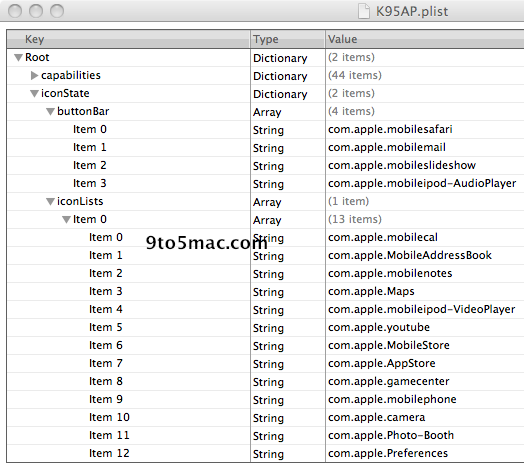 Sources have told us that ‘K94’ is the iPad 2’s codename and interestingly enough, there’s a K95 in the same file section too. Is this the 3G version of iPad 2, or a dual-band? Back to the camera… why so few megapixels? We speculate the amount is due to some serious tapering on the iPad 2’s edges, as shown on the physical iPad 2 mockups found at CES. What about software? We have already unearthed a couple icons pointing to cameras in Apple’s next iPad, and these icons also happen to hint at the lack of a screen resolution in change in the iPad 2. We also posted screenshots of the iPad 2’s purported camera app, or an internal app, which Apple is using to test the iPad 2’s still and video camera hardware. Will you be happy with a 1 megapixel, 720P video camera on the iPad 2? Discuss! Update: We’ve added proof, after the break, that K95/K94 are in fact 2nd gen iPads. Hint: the references to Photo Booth, Camera, and FaceTime on the home screen.